The Shaggy Dog Raconteurs are a Folk-Rock/Blues/Americana quartet with a dash Bluegrass and Ragtime. The band are based in and around Gloucester. They have songs to make your grandmother blush and your grandfather whistle. Full moon is their only night off from writing melody imbued original songs which tell strange stories of life's mundane shadows and un-blessed souls. Tall tails… toe tapping yarns. They started as a duo in January 2016 and recently expanded our lineup to a quartet. 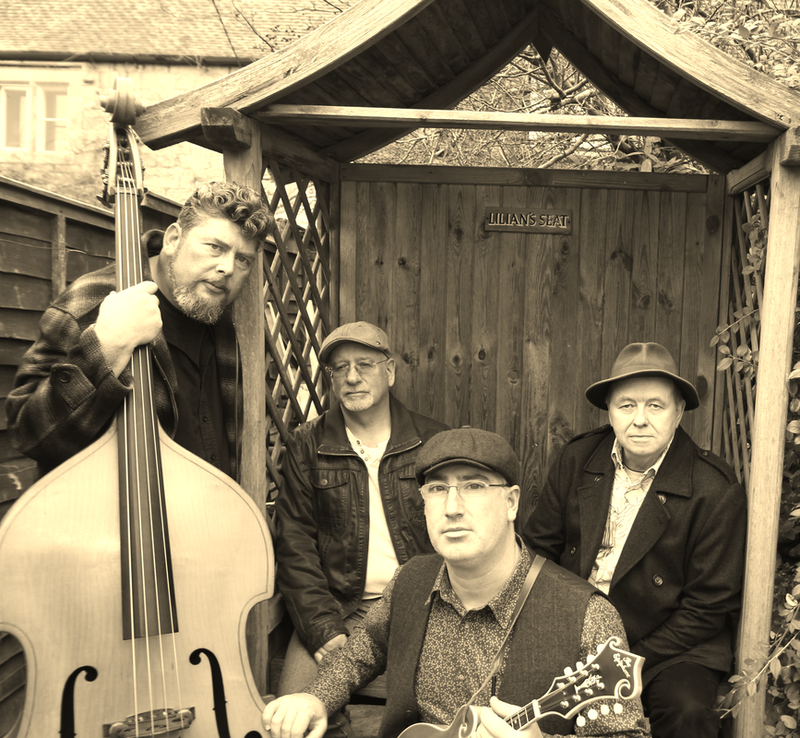 The Shaggy Dog Raconteurs are an original 4-piece Folk-American/Blues/Alt-Country group from Cheltenham, Stroud & Stonehouse, Gloucestershire, England. Rooted by their influences in Blues, Jazz, acoustic Americana and Soul, the quartet are forging a musical path all their own. The collaboration of Guitarist Bill (Billdog), Bassist Duncan Birch, Mandolinist Matt (Mattley) and percussionist Brendan (Old Yella Dog) is built upon a common dedication to the craft of songwriting, unifying the poetic ease of their lyrics with unforgettable melodies, harmonies, articulate bass and unifying percussion. The path to now began when guitarist and lead vocalist Bill and U-bassist Andy met on a windswept terrace in the Stroud valley on a dark, rainy night in January 2016. They worked on four of Bill's original songs that night including Soakin', No Weary Sense, and Rosie & Charlie. They collaborated effortlessly on their newly developed material and it wasn't long before the pair found the perfect compliment in mandolinist Matt. Matt's fledgling mandolin playing, stunning voice and percussion gelled quickly and led to many open mic slots for the then trio. Many new songs were written, including "Summer Sun", "Breaktime" and "Little Red Shoes" and "The Dogs' " sound began to really take shape as they collectively "barked up the right tree"! Percussionist Brendan joined shortly after a brace of appearances at The New Inn, Gloucester and it became undeniable that something unique was under way, as their individual sounds came together as one. They didn’t know it yet, but this was the beginning of the pack phenomenon we now know as The Shaggy Dog Raconteurs. The quartet didn't just lie in their baskets over the following months, instead they spent their time polishing their live material and playing the local circuit. Songs worthy of a full-length album were quickly coming to life, and a curious hum among the Gloucestershire music scene was building around their folk, roots, and dark-country inspired sound. Their collaborative influences brought catchy country choruses, as heard on their new single titled "Soakin'”, a wild west inspired sinister folk stomper called “Hortense Won't Be Mine”, and unapologetic toe-tappin' old-time Vaudeville via tunes such as “Rosie and Charlie” and the ragtime cover “They're Red Hot”. Their set-list crossed genres and touched on the hearts of true music lovers. In August 2018 sadly Andy announced that he was leaving the band. This was a real blow to the band who had to then take a break from performances whilst a suitable replacement could be found and taught the songs. In Sepember 2018 Duncan Birch joined the band . Duncan is a quick learner and the band are once again back on the gigging circuit.